Can Rate Reductions Near the End of a Frac Treatment Induce Tip Screenout? Why/when would pump rate be reduced near the end of a fracture treatment ? 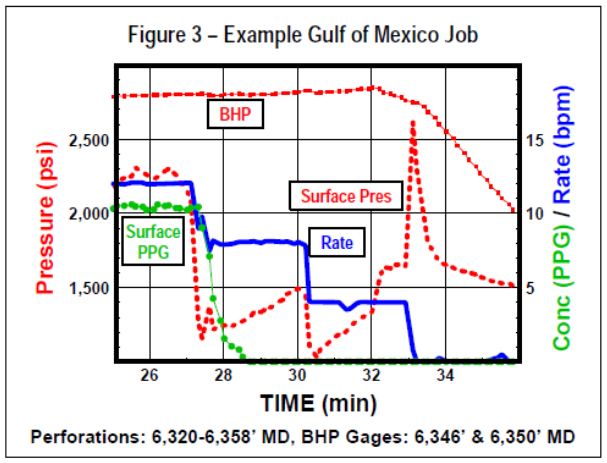 c) surface rate or pressure limitations, d) possibly improved fracture conductivity/width, and e) possibly improve the near wellbore gravel packing. From a fracturing standpoint, the only time a rate slowdown is acceptable is after a tip event has occurred. If tip screenout has halted fracture propagation prior to the rate reduction, then at a minimum the first 3 positive goals (a, b, and c above) are achieved. Why can the rate be slowed down after a tip event without detrimental effect on the frac? When the tip event occurs, fluid loss begins to decrease as seen in Figure 1. Why does the fluid loss decrease after the tip event – because the tip screenout (TSO) halts fracture propagation and no “new” fracture area is being created. area into place (Figure 2). Continued pumping above the fluid loss rate then drives net pressure up, forcing increased width. The subsequent high proppant concentration stages fill the fracture, leaving a wide proppant pack. Because fracture area is “pinned”, the rate at which the high concentration stages fill the fracture does not matter, provided rate is greater than leakoff rate. That is, fracture area is now fixed, and regardless of pump rate (presuming it is above fluid loss rate), the same volume of proppant is being placed over the same fracture area. Thus, average fracture conductivity, kfw, is independent of the final pump rate(s). What happens if a tip event did not occur? Should a rate slowdown be undertaken to “induce” TSO? A field example will be used to illustrate a possible outcome of attempting to use rate slow downs to “induce” a tip event. 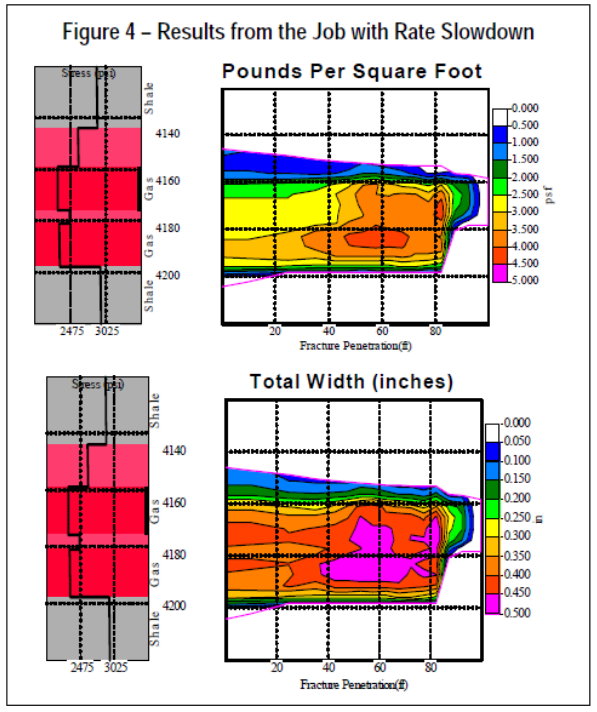 A 25,000 lb (7,400 gals) fracture treatment on a Gulf of Mexico well is pumping along, and no tip event is noticed (Fig. 3). below fluid loss rate, causing fracture width to decrease. This may have triggered bridging right at the top perforation, and forced the total screenout. 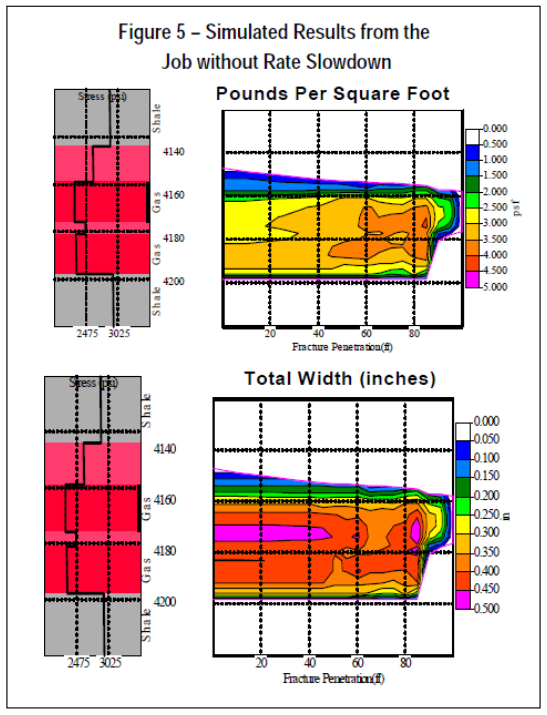 However, this screenout (and the resulting surface pressure increase) is not applied to the for-mation and therefor has no effect on fracture width/conductivity and does not contribute to any wellbore annulus packing. The behavior of the actual stimulation was modeled as seen in Figure 4. Note the reduced proppant concentration and width near the well. Proppant concentration is higher away from the wellbore. The annular pack is questionable because of the near wellbore pressure event above the top perforation. The same treatment volumes are modeled with no rate slow down (results in Figure 5). This yields a higher proppant concentration near the perforations, and greater width near the wellbore region. Both lead to higher productivity. What about the annular Pack? The annular pack could be obtained by flowing the fracture fluid back through the screen/annulus, taking surface returns on the annulus prior to the fracture closing. 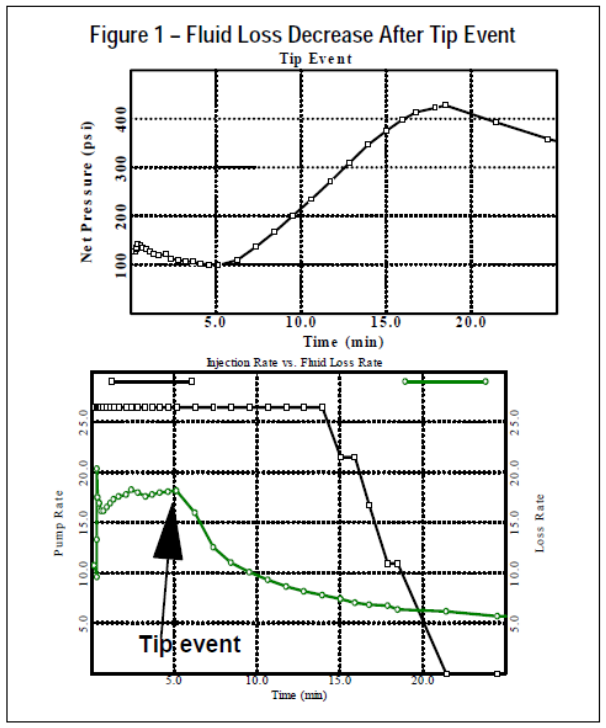 For this case, and probably in general, it is evident that rate slowdowns do not “induce” a tip event. If a tip event does not occur as designed, drastic rate slowdowns can be detrimental to the outcome of the propped fracture. 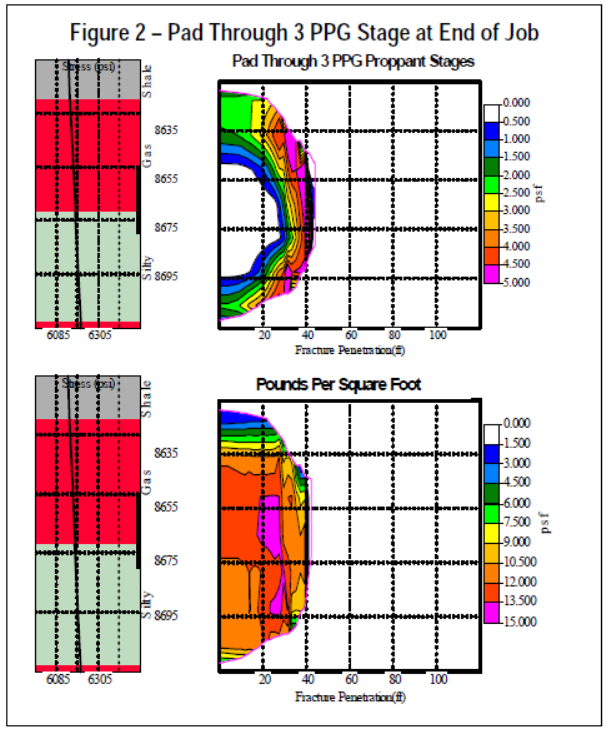 The near wellbore pressure event may (or may not) indicate a good annular pack. A less “damaging to the fracture” method of achieving the annular pack is to take returns through the screen just at the end of the job. That is, injection rate should be maintained above fluid loss rate to insure no near well fracture closure. Just at the treatment end, injection rate is decreased and returns are taken through the screen. This combination insures that back flow into the annulus will come from the fracture, giving a good annulus proppant pack. If fracture closing is allowed prior to a flowback, some flow may come from the formation, bringing formation fines into the gravel pack!